Well it looks like these winds are finally going to back off and at the time of writing this report the forecast is for winds light this weekend and mostly sunny. When you are lucky enough to get that kind of forecast in late September the place to be is the South Arm of the Fraser, aka Sandheads, the Green Can, or the White Light Ship. This time of year there are good number of large white springs on their way to the Harrison and Chilliwack Rivers that are hanging out in that area. Hanging out is probably not the best description, as we often catch these springs in the Chilliwack River with sea lice still attached. That tells us they don’t spend a lot of time off the Fraser mouth, they show up, most likely hang out for a tide or two and head up the Fraser quickly. We think a lot of these fish come around the S end of Vancouver Island, then up the Strait of Georgia and right into the South Arm of the Fraser. Some will get pushed up to T-10 or the North Arm, but not many. The hot spot for these fish is definitely the South Arm, so try and take advantage of this forecast. As usual, a mix of chrome flashers and teaser heads on your shallower rods going to glow flashers and teaser heads on your deeper rods, is a productive way to fish for these chinook. Form 30-80 on the riggers is the best zone, depending on the day, the colour of the water, and how sunny it is. We highly recommend fishing bait on all 4 rods, usually a mix of anchovies and herring. Sometimes a white hootchy on your shallowest rod will produce well for coho if you want to switch it up. Expect to see more and more coho as we get into the back end of September. All wild coho must be released. A productive half-day trip fishing off of the North Shore! The Cap Mouth has been producing some chinook as well. This is a good bet on the flood tide if you don’t have the time to run all the way down to the South Arm. There have been fish taken on every flood tide with a few pretty solid days. It looks like a bit of rain on Friday, but after that the long range forecast looks dry all the way out until Oct 6. This is good for this fishery as it keeps the river low and forces the chinook to stack up off W. Van and the remaining coho as well. Every flood tide through the rest of this month and into the fist 2 weeks of October can bring in chinook, so there is potentially a lot of good fishing left. As usual, a glow flasher and teaser head with a herring or anchovy, fished close to the bottom, is the most productive technique. This is one of my favourite times to get out on the water. The air is nice and crisp each morning, lots of anglers have called it quits for the season because the kids are back in school and vacations days are all used up, and the biggest chinook of the year are swimming around. 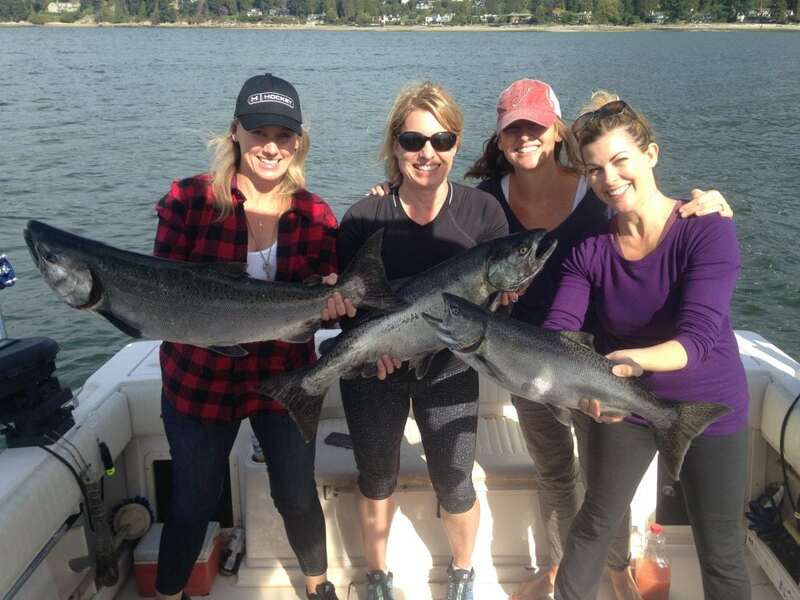 If you are looking for a fun half-day trip, now is the time to book a flood tide charter for big chinook only minutes from Vancouver at the Cap Mouth. If you would like a full day trip, you can’t beat a day down at the South Arm for lots of action from big chinook and coho.